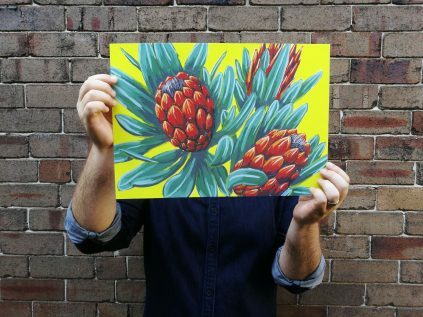 John, better known as Pitok, is a Sydney based artist working out of his studio space in Marrickville. his work explores the intersection of kitsch Australiana and the aesthetics of classic and contemporary Japanese art making practices. his creations include original gouache paintings currently on display at Hypmotive hub, as well as limited edition prints, postcards and clothing. Many of Pitok’s works are still life pieces, that reflect on identity and how we represent ourselves through the life long collection of ‘things’.you can become a part of his art making practice, by joining one of his ‘Mindful painting’ classes. bring along a unique item, and have it join his ever growing collection of accumulated still life stories. Week 2018. his works have been exhibited in the Glebe Art Show, RAW Artists and Symposium Sydney.